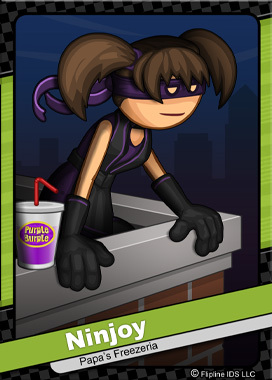 Ninjoy is a mysterious masked girl who is a master of stealth and purveyor of sweet ninja skills. Local news claims she is a delinquent outlaw who would steal candy from a baby. However, more and more people are coming forward with accounts of Ninjoy’s heroism and good deeds. Bad or good, one thing is certain: Ninjoy never misses a meal. She can almost always be found eating at one of Papa’s many restaurants.